DREAM IT. DESIGN IT. ORDER IT. Our exclusive online catalog includes premium brands like Alternative Apparel, Arborwear, Econscious, Eddie Bauer, L.A.T., and Next Level Apparel when the basics just won't cut it. All you need to know to place your first order in a four part guide. With our extensive catalog of thousands of products from dozens of manufacturers, finding just the right fabric can be a challenge. We‘ve broken down your options to help you find what you need based on softness, wicking, breathability, and cost. A quick primer on different fits available for men‘s and women‘s sizes. Fitted sizes tend to run small. Unisex sizing (the least fitted) is also available and typically ordered for men. There are also fabric Considerations that may affect the actual size: Wovens vs. Knits, Fabric Content, Knit Tension, Shrinkage, and Fabric Finishing. Our facility is equipped with every capability to handle your project, no matter how small or large it may be. We pay close attention to our industry and the state-of-the-art technologies, and operate a state-of-the-art facility that is equipped with all major decoration processes for your custom apparel. Click on any box to learn more. Screenprinting is a process that involves pushing ink through a woven mesh stencil onto fabric. Embroidery is a process where thread is stitched into your custom product by a machine. DTG is a process where a printer directly applies the ink onto the t-shirt with inkjet technology. A form of Digital printing where designs are printed on various base media and applied to shirts via heat press. Once the job is complete, we have the capability and experience to manage and execute your specific packaging, finishing and shipping needs. All our labeling services include removing the manufacturer's label and replacing it with your own custom label; attaching your in-store hangtags ready to ship direct to Retail; or applying custom tagless relabeling for comfort and Brand recognition. Click on any box to learn more. 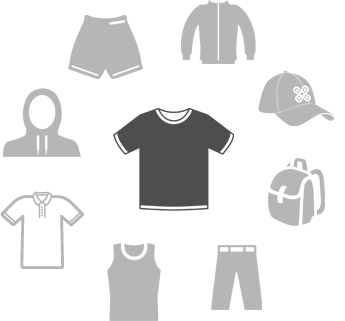 Find exactly the right apparel for your project. Our huge online catalog helps you quickly find tees, polos, hats, jackets, and more. Our facility is equipped with every capability to handle your project, no matter how small or large. For over 25 years our goal has been to ensure our customers never have a reason to go anywhere else.